Pizza, big dogs, hard work, the Chicago Bears and beer! Team sports in school - soccer and basketball. Occupation: Marketer What inspires you? Dedication and focus. The extreme climate of Chicagoland and an internal soundtrack courtesy of the Pixies, it was no wonder the end result would be a rough and tough roller derby blocker. 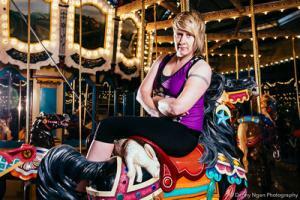 Brought to Seattle by a series of life twist and turns, the rugged scenery and the intensity of the music scene made sure she would never leave. Don't tell her she can't do something, because that'll just make her do it with honors.